What looks like a retina of an eye is a unique software application that listens to the music and shows you the tones and chords being played. From any audio. In real-time. Get it now. And hey, it’s free! This is the answer to all my questions. A musician who randomly met me in the Prague metro. What does HarmonEye do? See what you hear! 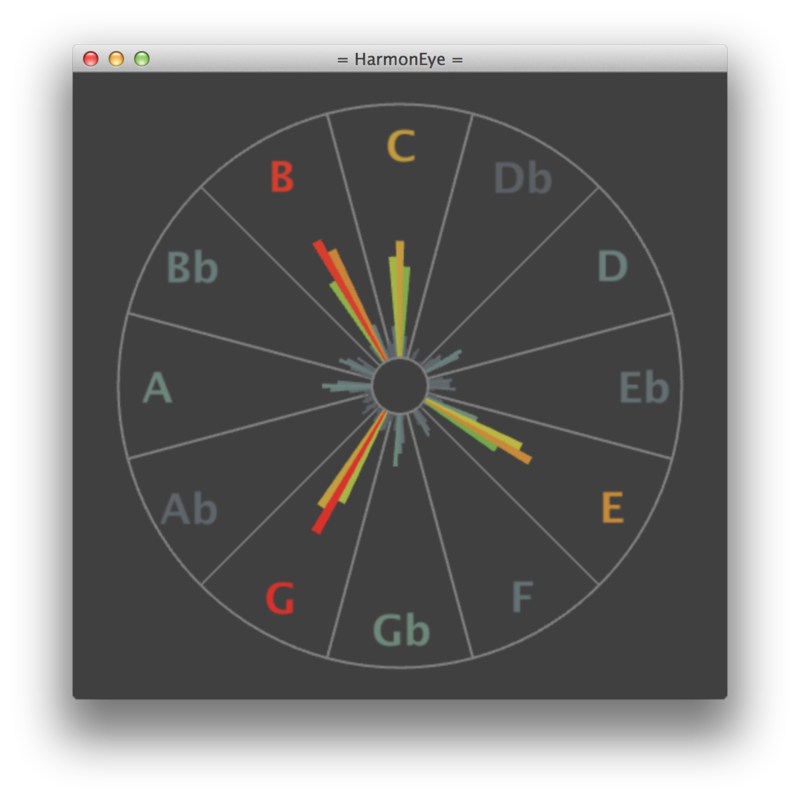 HarmonEye is a unique software application that listens to the music, applies some deep math under the hood and shows you the tones and chords being played. It is able to process any audio on your computer. It works in real-time so that you don’t have to wait. The intensity of each tone in an octave is shown as a segment of a circle (like on the clock). A loud tone makes a long red segment. Multiple tones make a chord. As the music plays the circle is animated. In fact, it looks like a retina of an eye! From that you can easily see the melody, chords and the key of your favourite songs. Including the nuances like a singer’s vibrato. You can learn singing or playing guitar, piano or other instruments more effectively. You can write it down. Or just look at it for hours and be amazed like me! How can HarmonEye help me? Perfect pitch for everyone! With HarmonEye you can explore the amazing world of music visually. By “giving you perfect pitch” it helps you in easier transcription of the melody and the chords of your favorite tunes. You can see the patterns in music and so better understand the harmony or just enjoy new insights to the music. Who might benefit from HarmonEye? All music lovers. Whether you’re an amateur or an professional, a musician or a listener, a student or a teacher, HarmonEye might help you. To understand the principles you don't even need to know anything about notes. On the other hand if you know the music theory you might get deeper insights. In fact, by treating the things visually, you might even comprehend things from the music theory naturally while avoiding eg. the artificial complexity of the standard notation. How can I get HarmonEye? Enjoy and support a good thing. A good way to get HarmonEye running on your machine is to download the package. Note that HarmonEye is presently available both for Mac OS X desktop and Android. Why HarmonEye is not open-source, for mobiles or other platforms? I'd love it to be so, too! It just takes some time and work. Would you like to support the development of HarmonEye? God bless you! You can donate via PayPal and/or tell your friends, make a video, write a review. Every buck goes directly to making HarmonEye better. Thanks! Finally, stay in touch and enjoy! Notify me via email when important things happen from time to time. Such as when we make a ground-breaking update or publish some interesting articles on music theory and practice. I hate spam as you do. The traffic should be low and you can unsubscribe anytime. We trust the MailChimp service.